We’d love your help. Let us know what’s wrong with this preview of French Rhapsody by Antoine Laurain. Middle-aged doctor Alain Massoulier has received a life-changing letter—thirty-three years too late. Lost in the Paris postal system for decades, the letter from Polydor, dated 1983, offers a recording contract to The Holograms, in which Alain played lead guitar. Back then The Holograms had believed in their cutting-edge sound. However, the music industry remained indiffere Middle-aged doctor Alain Massoulier has received a life-changing letter—thirty-three years too late. Lost in the Paris postal system for decades, the letter from Polydor, dated 1983, offers a recording contract to The Holograms, in which Alain played lead guitar. Back then The Holograms had believed in their cutting-edge sound. However, the music industry remained indifferent, and eventually the band split up, each going their own way. Alain is overcome by nostalgia, and is tempted to track down the members of the group. But in a world where everything and everyone has changed . . . where will his quest take him? To ask other readers questions about French Rhapsody, please sign up. This book caught me a little by surprise. I thought it was going to be about music and nostalgia for the past. Instead it is about a whole lot more including how we chose to lead our lives and how the ripples from these choices affect others. Alain Proust, a middle aged GP, leading a quiet and staid life, receives a letter lost in the mail for 33 years. The letter is an invitation for the band he played in, the Holograms, to meet with a record company interested in a demo tape they sent in all th This book caught me a little by surprise. I thought it was going to be about music and nostalgia for the past. Instead it is about a whole lot more including how we chose to lead our lives and how the ripples from these choices affect others. Alain Proust, a middle aged GP, leading a quiet and staid life, receives a letter lost in the mail for 33 years. The letter is an invitation for the band he played in, the Holograms, to meet with a record company interested in a demo tape they sent in all those years ago. Nostalgic for what might have been if the band had got a recording contract, Alain goes on a quest to find the rest of the band and a copy of the demo tape. The band members have all lead an interesting variety of lives, none of them in music. Sebastian Vaugan, the bass player became a right wing politician and started his own extremist, rabble rousing party. Stanislas Lepelle the drummer has made a name for himself in the world of contemporary art with his giant outdoor installations across the globe. Frederic Lejeune the keyboard player has made a new life for himself in Thailand where he runs a resort and Berengere, the vocalist went home to run her parents hotel. Lyricist, Pierre Mazart opened an antique shop, and his more famous brother, Jean-Bernard Mazart, (aka JBM) their producer has become a super wealthy economist and business man. One by one Alain tracks them down. Each of the main characters gets to tell their own story and their pasts and presents start to intersect and collide, taking the book in unexpected directions. You reach the halfway point of the book before you can see the glimmers of how this all might all come together. And then it just goes off the rails. What had been fairly low key turns hysterical. There is a real comic turn here that I was totally unprepared for. So, for those who are frustrated by the beginning of the book, stay the course. My thanks to netgalley and Gallic Books for an advance copy of this book. Having loved The President's Hat and The Red Notebook, I looked forward with glee to Antoine Laurain's latest book. "French Rhapsody" has a fabulous set-up: after mistakenly being lost at the post office for 33 years, a letter arrives for our protagonist, Alain. Alain and his friends were once members of an experimental New Wave band called "The Holograms" and the letter is from a major record label expressing interest in recording the band. Of course, since the letter never reached them, Merde. Having loved The President's Hat and The Red Notebook, I looked forward with glee to Antoine Laurain's latest book. "French Rhapsody" has a fabulous set-up: after mistakenly being lost at the post office for 33 years, a letter arrives for our protagonist, Alain. Alain and his friends were once members of an experimental New Wave band called "The Holograms" and the letter is from a major record label expressing interest in recording the band. Of course, since the letter never reached them, The Holograms have long since split up, the members have lost touch, and most have gotten "real" jobs. Laurain uses this same serendipitous plot structure, and mixes in whimsy, humor, a sense of place, and a certain je ne sais quois to great effect in his previous books. Sadly, all the charm is missing here. Several side characters are introduced, and their story lines crowd out the overlying arc of Alain trying to find his former band mates. I kept hoping the book would pick up, but at 50% of the way in decided to call it a wrap. Thank you to NetGalley and Gallic Books for a galley of this book in exchange for an honest review. 'French Rhapsody' is my third Antoine Laurain novel/novella I've read this year. I love novels where different characters's stories/lives intersect either serendipitously or on purpose. Antoine Laurain is very good at putting together such stories. In the "French Rhapsody', Alain Massoulier, a general practitioner (doctor) receives a letter 33 years later. The letter could have changed his and his friends' destinies when they were in their early 20s and were trying to make it in the music world a 'French Rhapsody' is my third Antoine Laurain novel/novella I've read this year. In the "French Rhapsody', Alain Massoulier, a general practitioner (doctor) receives a letter 33 years later. The letter could have changed his and his friends' destinies when they were in their early 20s and were trying to make it in the music world as the new wave, cold wave band the Holograms. So Alain is trying to get in touch with his former bandmates, to see if any of them still have the recording that could have propelled them to fame. While doing this, we come to meet many other characters. It's interesting to note how all of them had chosen different paths: an economist, a hotel owner, an extreme right wing nut-job politician, an art/antique dealer and a large-scale sculpture artist. Some of the characters were more interesting than others. I must confess I found it hard reading the extreme right-wing's character's incessant speech and hate monologues, so I kind of skimmed over that part. Another character that plays a big part in this novel is JBM, a very accomplished businessman. It's obvious that Antoine Laurain, like most people, is disillusioned with the state of the French politics and the career politicians who don't have much of a backbone. So he created JBM, who's too good to be true, short of a fantasy of what a good politician should be. As with all previous Antoine Laurain novels, nostalgia is present throughout this book. While this novel wasn't as charming and well put together as 'The Red Notebook' and 'The President's Hat', it was still a very enjoyable read. Looking forward to reading 'The Portrait', which comes out in July 2017. [3.5] Light pop fiction in unexpected political commentary shocker. Having a substantial queue of large/serious books I need[ed] to get read for the Netgalley stats was not a logical reason to lengthen that queue with smaller fluffier books I wasn't too sure about (and I'm still working through the lot months later). But this was a pleasant surprise: not a cheesy chicklit romance like the author's last translated title, The Red Notebook, nor is it, as one might expect from a novel about middle-aged former band members, just a French Nick Hornby. Though, as Laurain is trying out that favoured contemporary lit mode, the polyphonic cast of multiple narrators (alongside third-person interludes) it has its moments of both. Yes, there are the storylines one would expect from a mainstream novel about people who were in a band that didn't quite make it 33 years earlier - ageing, lost loves, people growing up and growing apart, and the romance of fame that could have been. But Laurain also seems to be getting his satirical chops on to have a dig at a fellow author with a considerably darker view of France's possible future, via the straggly-haired balding keyboard player who now lives in Thailand with his younger fiancee and unappealing personal habits. Meanwhile, the bassist is now the leader of a French far right activist group that has grown substantially in recent years, and their amateur manager is now a tech tycoon with an uncanny knack for timing investments, a likeable but reserved man of high public popularity and ascetic habits, who later in the novel reveals he is an admirer of the highly principled former Paraguayan President Mujica. Rhapsodie Francaise was first published in France in January 2016; it's evidently had at least a little bit of editing, because this ARC from August 2016 (official English language publication date was Oct 2016) mentions the death of Prince - as well as that of Bowie, which it's not totally impossible was in the original, if it was added right on the wire before an end-of-Jan printing. Hard to tell just how much else has been changed or added, but even as a book pre-dating the election of Trump it's fairly prescient - even more so if it was in something very close to its current form 12 months ago, before the Brexit vote, and before Trump was seen as a serious candidate and it was so clear that the public was hungry for candidates from outside the political establishment and the recent status quo. So this may or may not be a relatively different novel from the French original; if my French were better, I might order an early French edition and find out. In juxtaposing two of the characters above, I've probably made the book sound rather more predictable than I found it until perhaps 2/3 of the way through - because for me the political element, and the amount of story it took up, was unexpected. It could be easy to deride as liberal wish fulfilment (and some of it, on the right and the left, includes improbable policies that simply don't fit contemporary global strategic or environmental conditions (view spoiler)[such as the far-right leader who wants to re-colonise old colonies, or the amount of economic growth JBM achieves (hide spoiler)]. The West Wing, a far more substantial body of work, was criticised by cynics as just that sort of pie-in-the-sky. But now, at a time when both the news and a great deal of new writing, both fiction and non-, is dystopian, it's a lovely and refreshing change, to spend a short time in a fictional world where things might work out differently. It's an alternative way of writing escapist fiction, one which doesn't neglect present realities, and I have to say it rather works. Unfortunately the soapier elements of the novel have some of the usual silliness that can afflict this sort of story; drama prolonged by people not telling each other stuff for no good reason, general fancifulness, a silly twist; all of which means I wouldn't quite round it up to four stars (it was also better than the 3-star effort I expected). There aren't a huge number of people on my friendslist who'd read a book like this, but if you are looking for a silly, escapist light read that doesn't contain too much romance, and which is frank about the state of contemporary politics, and especially if you've ever cared a lot about pop music, this may be worth a look. "خوشبختی همین است،همه انچه که در طول جوانی ات به دنبالش بودی،همان دخترجوانی که در انتهای تمام رویاهایت به او می رسیدی!" "سی وسه سال بود که اورا ندیده بودم،چقدر گفتن این جمله سخت است.با اینکه هیچ وقت "در واقعیت"او را ندیدم،همیشه در افکارم حضورداشت،هر بار به او فکر میکردم،پس از آن خبری از او می شنیدم.همه این ها خیلی دور است،تصاویر به گونه ای درذهنم تجلی پیدا می کنندگویی عکس هایی هستند که در یک جعبه کفش در انتهای کمد نگهداری میشده اند و یاد آور دوران کودکی یا جوانی مان هستند و تنها کاربردشان این است "خوشبختی همین است،همه انچه که در طول جوانی ات به دنبالش بودی،همان دخترجوانی که در انتهای تمام رویاهایت به او می رسیدی!" When life gives you lemons, make lemonade, so the proverbial phrase goes. The five member new wave/cold wave 1980's band, the Holograms has dispersed in the absence of record company interest. The four instrumentalists, female singer and producer, while united by music, have taken different life journeys. Their paths will ultimately cross again. In the 1980's, Alain Massoulier, electric guitarist is the contact person for record company correspondence. Fast forward thirty three years. Alain recei When life gives you lemons, make lemonade, so the proverbial phrase goes. The five member new wave/cold wave 1980's band, the Holograms has dispersed in the absence of record company interest. The four instrumentalists, female singer and producer, while united by music, have taken different life journeys. Their paths will ultimately cross again. In the 1980's, Alain Massoulier, electric guitarist is the contact person for record company correspondence. Fast forward thirty three years. Alain receives a formerly undelivered letter written in 1983 from famous record label Polydor. The Polydor Artistic Director Claude Kalan wants to meet with the Holograms. Alain, now a middle-aged physician becomes overwhelmed thinking about what might have been. Searches for old photos of the band and the studio recorded cassette are fruitless. Alain is determined to contact each band member attempting to locate a copy of the thirty three year old cassette. He especially wants to hear "Such Stuff as Dreams Are Made On", seemingly a song which garnered interest. Alain reaches out to former bandmates. Each has embarked on a different path; a right wing extremist, antiques dealer, contemporary artist, internet entrepreneur, and resident of Thailand. We get a thorough understanding of the life choices each has made. There is,however, a nagging question- What if the Holograms had been a successful band on the scale of the Rolling Stones? "French Rhapsody" by Antoine Laurain encourages the reader to flash back to a time of cassettes, fewer TV channels, and correspondence by snail mail. The world has changed and life as Alain and bandmates knew it has faded away replaced by a fast paced techno world. My favorite character is JBM. JBM is a reassuring, calm man who can measure the pulse of the economic pendulum. A most enjoyable read. Antoine Laurain continues to craft creative, timely stories that will delight his audience while also making his readers think about what is happening in the world around them. While The President’s Hat remains my favorite of his books, French Rhapsody was a fantastic read, and I thoroughly enjoyed it. Paris physician Alain Massoulier receives what would have been a life changing letter in the mail 33 years after it was sent to him. With a number of other individuals that we slowly get to know, Alain had been in a band called The Holograms in the 1980’s. After receiving little encouragement from the music industry, the group had broken up and gone their separate ways. The delayed letter offered the group a recording contract. This letter sets in motion a chain of events that alters the lives of several of the individuals originally associated with the Holograms. Laurain explores the idea that one event or happenstance can cause a ripple that impacts the lives of many individuals. The plot was not predictable, and several events occurred that I most definitely did not see coming. I always love when an author can surprise me with a plot twist, and there were several in French Rhapsody that really moved the story along. The book was wonderful from start to finish. Laurain makes some very relevant statements about issues facing a number of countries today such as the refugee crisis and the impact on Europe and the United States. As these countries attempt to integrate refugees into their societies, there has been an increase in extreme xenophobic right wing groups advocating hatred and intolerance. His French Trump-like character is symbolic of individuals trying to gain power in a number of these countries and the length these individuals will go to in order to try and succeed. On a lighter note, Laurain pokes fun at the contemporary art scene and the attitudes of some of these contemporary artists. A particularly hilarious scene results from this storyline – I can’t say more without spoiling the event, but it was fantastic. While I was intrigued by almost all of the characters, JBM was my favorite character by far. Every country could use a JBM, and I certainly wish the United States had someone like that right now. I highly recommend this novel and his previous two books also. Laurain has a lot to say, and it is worth listening to him. Thanks to NetGalley and Gallic Books for the opportunity to read this ARC in exchange for an honest review. Enchanted would be the word I would use to describe The Red Notebook by this author. Charmed would be my one word description for The President's Hat. Divergent would be the word for this book. There was a common point at the beginning of the book in that the main characters were all connected to a musical recording made thirty years earlier. The action starts in the form of a letter (lost) and finally delivered. There is a journey to reunite the members of the band and find a long lost recordin Enchanted would be the word I would use to describe The Red Notebook by this author. Charmed would be my one word description for The President's Hat. Divergent would be the word for this book. There was a common point at the beginning of the book in that the main characters were all connected to a musical recording made thirty years earlier. The action starts in the form of a letter (lost) and finally delivered. There is a journey to reunite the members of the band and find a long lost recording. This is where divergent comes in for me. Too many side stories...ramble... ramble as the author incorporates art, politics, music (both classical and contemporary), nostalgia and mystery. I just finished what I think is going to be my favorite book of all times! I read Laurain's two other translated books and loved them! I knew I'd enjoy this one too, but there's just something so perfect about French Rhapsody that I am not sure I can articulate my thoughts. The charm, humor, character development and the French culture Laurain has shared with the reader is precious. Perhaps it's just me, my love of Paris and my desire to live there but I felt so much a part of the story - laughi I just finished what I think is going to be my favorite book of all times! Ich mag die Bücher von Antoine Laurain und war daher sehr neugierig, zumal der Klappentext eine charmante Geschichte versprach – leider hat er mich ein wenig in die Irre geführt, und das Buch entwickelte sich ganz anders als erwartet, trotzdem aber hat es mich gut unterhalten können. Alain ist Arzt und erhält mit 30 Jahren Verspätung den Brief einer Plattenfirma, die ihm und seiner damaligen Band einen Vertrag anbietet – zu den ehemaligen Bandmitgliedern hat er keinen Kontakt mehr, aber was wäre Ich mag die Bücher von Antoine Laurain und war daher sehr neugierig, zumal der Klappentext eine charmante Geschichte versprach – leider hat er mich ein wenig in die Irre geführt, und das Buch entwickelte sich ganz anders als erwartet, trotzdem aber hat es mich gut unterhalten können. Alain ist Arzt und erhält mit 30 Jahren Verspätung den Brief einer Plattenfirma, die ihm und seiner damaligen Band einen Vertrag anbietet – zu den ehemaligen Bandmitgliedern hat er keinen Kontakt mehr, aber was wäre geworden, wenn der Brief ihn damals rechtzeitig erreicht hätte? Alain schwelgt in Erinnerungen und macht sich auf die Suche nach seinen ehemaligen Freunden. Man könnte meinen es ist Alain, der im Mittelpunkt des Buches steht, dem ist aber nicht so – vielmehr lernt man jedes einzelne Bandmitglied in seinem aktuellen Umfeld kennen und erhält so einen interessanten Spiegel der heutigen Gesellschaft vorgehalten. Dass es jeder der ehemaligen Musiker zu einer hohen Position gebracht hat, fand ich ein wenig unrealistisch, trotzdem aber war es interessant, einen Blick in die ganz unterschiedlichen Lebensweisen zu werfen. Dabei sind die Charaktere nicht alle sympathisch und es erstaunt, was aus ihnen geworden ist, sie sind aber alle sehr gut gezeichnet. Da gibt es einen Präsidentschaftskandidaten, einen Künstler, einen rechtsradikalen Politiker, einen Aussteiger und einen Computerfreak – als Leser wartet man natürlich auf das Zusammentreffen, doch es kommt dann alles ganz anders. Anfangs fand ich es verwirrend mit den vielen verschiedenen Personen und Namen, zumal die Erzählstränge lange Zeit parallel laufen und erst spät zueinander finden. Die letzten 100 Seiten werden dann aber richtig spannend, und hier konnte ich das Buch auch schlecht aus der Hand legen – das Finale hat mich dann kalt erwischt und auf charmante Weise überrascht. Der verlorenen gegangene Brief oder auch die Musik spielen nicht so eine große Rolle, wie es der Klappentext einen glauben lässt. Vielmehr sind es die Schicksale der einzelnen, die überraschen und interessante Wege und Wendungen einschlagen, der Brief und auch die Musik sind da eher der Aufhänger für die Geschichte. Toll fand ich wieder mal den Schreibstil, der charmant und ironisch, schelmisch und einfach sehr französisch ist – das muss man mögen. Ich gehöre zu denen, die französische Romane und ihre ganz eigene Atmosphäre lieben – und so habe ich mich auch hier wieder sehr wohl gefühlt. Die eine oder andere Länge konnte ich so dann doch verschmerzen, insgesamt gebe ich daher 3,5 von 5 Sternen. Un autre très bon roman d'Antoine Laurain. Bien écrit, plein d'humour. Un peu lent à démarrer, cependant. Laurain cleverly addresses several topical subjects in his latest novel. Politics, aging, art, music and lifelong dreams dovetail nicely in this story about a missing letter, a missed opportunity, a missing tape, and a missing father. Mining the 80's for material, Laurain creates characters who will keep you interested to the final pages, when you'll be rewarded with a surprise ending. Lovely. La rapidité avec laquelle j'ai lu ce livre montre assez combien je l'ai aimé. Sans doute le happy ending y est pour quelque chose, mais tous les personnages sont crédibles, et les principaux, attachants. Ich habe bis auf “Liebe mit zwei Unbekannten” bisher jedes ins Deutsche übersetzte Buch von Antoine Laurain gelesen. Mittlerweile bin ich ein regelrechter Fan von des Autors. Was ich jedoch mit der Zeit gelernt habe ist, dass irgendwie jedes Buch von Laurain nicht das ist, was ich erwarte und jedes Buch mich trotzdem überzeugen kann. Allein schon deshalb, weil jedes Buch für sich eine ganze eigene Dynamik an den Tag legt und nicht mit den anderen Büchern des Autors zu vergleichen ist, so wie man Ich habe bis auf “Liebe mit zwei Unbekannten” bisher jedes ins Deutsche übersetzte Buch von Antoine Laurain gelesen. Mittlerweile bin ich ein regelrechter Fan von des Autors. Was ich jedoch mit der Zeit gelernt habe ist, dass irgendwie jedes Buch von Laurain nicht das ist, was ich erwarte und jedes Buch mich trotzdem überzeugen kann. Allein schon deshalb, weil jedes Buch für sich eine ganze eigene Dynamik an den Tag legt und nicht mit den anderen Büchern des Autors zu vergleichen ist, so wie man es manchmal bei Autoren macht (oder machen kann). Man kann zunächst meinen, dass es bei einem Buch mit dem Titel „Die Melodie meines Lebens“ nur um Musik und die altbekannte Nostalgie für die Vergangenheit geht. Aber es geht natürlich um einiges mehr. Um verpasste Chancen und verlorene Lieben, Freundschaften, die sich auseinanderleben, um Fragen wie „Was hätte sein können?“ und „Was wäre, wenn…?“. Eben genau darum, wie das Leben nun mal spielt und dabei offenbar seine eigene Melodie und den eigenen Takt vorgibt. Eigentlich geht es hier nämlich nicht groß um die Musik. Sicherlich, als Alain, der ein ruhiges Leben als Arzt führt, den Brief einer Plattenfirma mit 33 Jahren Verspätung erhält, steht sein geordnetes Leben zunächst Kopf. Angetrieben von den Erinnerungen, sucht er die anderen Bandmitglieder, in der Hoffnung, dass einer von ihnen noch eine Kopie des damaligen Demobandes hat. Tatsächlich geht es dann aber eher um die einzelnen Bandmitglieder an sich. Darum, wie sie sich entschieden haben ihr Leben zu leben und wie diese Entscheidungen möglicherweise andere beeinflussen können. Niemand der ehemaligen Bandmitglieder ist der Musik treu geblieben, sondern sie haben in den 30 Jahren, die vergangen sind, völlig unterschiedliche Richtungen eingeschlagen. Herauszufinden, wie sich jeder Einzelne nach dem Scheitern von „The Hologrammes“ entwickelte, überlasse ich an dieser Stelle euch, denn es ist in Anbetracht der kurzen Romane von Laurain eh schon immer etwas kritisch, eine Rezension zu schreiben, bei der nicht allzu viel verraten wird. Wie ich schon sagte, jeder Roman des Autors entwickelt eine ganz eigene Dynamik, die mich in den Bann zieht. So ist „Die Melodie meines Lebens“ teilweise humorvoll aber auch genauso sanft und einfühlsam, versehen mit etwas Melancholie für Vergangenes. Aber man bewegt sich auch viel in der Gegenwart und darum, wie die einzelnen Bandmitglieder ihr Leben heute leben. Und damit dieser Roman auch absolut zeitgemäß wird, bietet Laurain gleichzeitig immer wieder einen kritischen Blick auf die heutige Politik. Zudem ist es immer wieder interessant, wie das Leben von Menschen sich manchmal zufällig oder absichtlich schneiden kann. Gerade in solchen Geschichten ist der Autor sehr gut, was er schon einige Male unter Beweis gestellt hat. Alain was the guitarist for the new wave group "The Holograms", and sent a tape to a record company, never receiving an answer. Now, so many years later, he learns that the company was interested in them. The band broke up as nothing ever happened to encourage them to keep on playing, Even the most staid people can have an amusing and fun life in their youth. Such is the case of Doctor Alain Massoulier, who in his middle age receives a letter that has been lost in the mail for more than 30 years. Mehr als 30 Jahre zu spät erreicht den Arzt Alain ein Brief, in welchem seiner Band The Hologrammes die Möglichkeit auf einen Plattenvertrag in Aussicht gestellt wird. Alain erinnert sich seiner Zeiten in der Band und versucht, die übrigen Bandmitglieder und insbesondere ein Tape ihrer Songs ausfindig zu machen. Die Idee zur Geschichte klang gut und das erste Kapitel gefiel mir erstmal ausgezeichnet. Anders als erwartet folgt die Erzählung dann aber nicht Alain auf seiner Suche, sondern fokussie Mehr als 30 Jahre zu spät erreicht den Arzt Alain ein Brief, in welchem seiner Band The Hologrammes die Möglichkeit auf einen Plattenvertrag in Aussicht gestellt wird. Alain erinnert sich seiner Zeiten in der Band und versucht, die übrigen Bandmitglieder und insbesondere ein Tape ihrer Songs ausfindig zu machen. Really more of a 3.5 if I’m honest, but since Goodreads STILL doesn’t allow for half-stars, I’ll round up. Laurain May be my favorite new-to-me author of 2018. This is the second book of his I’ve read, and while it had less whimsy than the romantic The Red Notebook, this novel similarly explores a lot of feelings and delivers a thoughtful and well-crafted story in a relatively short number of pages. I really liked the structure of this book and how it occasionally abandoned the main plot line to Really more of a 3.5 if I’m honest, but since Goodreads STILL doesn’t allow for half-stars, I’ll round up. I loved The President's Hat and The Red Notebook. But French Rhapsody was too contrived, and frankly, boring. The twist at the end made it a bit more interesting, but for most of the book I found the writing and the plot lackluster. I thought for SURE that this author could pull me out of my reading slump... nope. It has been a long while since I laughed out loud so many times while reading a book. French Rhapsody is the title that had my endorphins dancing a jig. A middle-aged married Parisian doctor who has been disillusioned about his profession and personal life for some time receives a letter that has been delayed by the postal service for 33 years. The letter was found along with 3 other pieces of mail during remodeling; when shelves were dismantled, four pieces of mail were found to have fallen behind the back of the shelves and the wall. It is an invitation from a music recording company to come for an interview, expressing approval for their demonstration tape. Although intended for the entire band of his youth, the Holograms, it was addressed to Alain Massoulier as his parents had the only stable home among the group. Alain had taken over his father’s medical practice and raised his own family at 38 Rue de Moscou, Paris 8e, and thus was the recipient. He was coincidentally outraged and gratified when the letter arrived. His confrontation with the postal supervision is hilarious. Alain has lost touch with almost everyone but has been haunted for some time by the memory of their sultry vocalist, the sole female member of the group, Berengere. Since Alain has suspected his wife Veronique of cheating on him, the memories of Berengere have been more frequent and lingered longer. After failing to find his own copy of the demonstration tape, he determines to contact the other group members to see if anyone has that tape. So, Alain the electric guitarist starts the search for his former band mates on the internet, of course. Beside songstress Berengere, he starts to track down drummer Stansilas Lepelle, bassist Sebastien Vaugan, keyboardist Frederic Lejeune, and lyricist Pierre Mazart. The demonstration tape had been funded by JBM, Jean-Bernard Mazart, brother of the lyricist Pierre. It is not hard to find JBM, as he is now a much politicized economist and massively successful businessman. The nostalgia of the piece is particularly poignant at this point in the story, when Alain confronts his memories of the band members when they were 20 years old, still full of life and stuffed to the gills with hope, with the reality of their physical appearance and their present lifestyles. Angel-faced pudgy Sebastien Vaugan is now a hardbody extreme right winger with his own group of followers, the White Western Party, who might run for the presidency, his movement has grown so strong. Stan Lepelle is a famous, moneyed artist who has garnered many prizes and awards including a beautiful young Russian model. Frederick Lejeune has a hotel in Thailand and Pierre Mazart runs an antique shop. Alain cannot locate Berengere. As Alain connects with each of these former bandmates, his enthusiasm for any possible reunion wavers and his recollection of “the good old days” loses its rosy glow as well. This is all good for the readers, however, because we are treated to the author’s satirical comic genius. Laurain takes on medical care, big business, tourism, politics, music, art, and the antiques business. Laurain tosses in a final jab, um twist, towards the end when Alain is able to meet with the music producer who sent that invitation letter in 1983. Laurain has written two prior books that American readers embraced – “The President’s Hat,” and “The Red Notebook.” He is a screenwriter and director of short films, a passionate lover of art who also has some experience in the antiques business. Born in the 1970s, Laurain has just hit his stride and we can expect to hear more from him for some time to come. 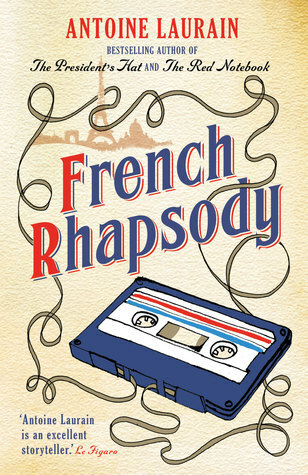 If you have a few hours, looking for a relatively quick read, but in the mood for something to keep your mind engaged and entertained as well as your humor meter humming, I think French Rhapsody is just your ticket. It is not in our library’s catalogue, but the major vendors have it on preorder and it will be available the first week of October 2016 in e-book and paperback. You might consider this for your book club’s list. My rating 4.0/5.0. I was given a galley of this book by the publisher in exchange for an honest review and I thank them. Reading 'French Rhapsody' isn't the worst mistake I've ever made. Although, if I'm being honest, had I have truly known what the novel was about I don't think I'd have ordered it and read it quite so eagerly as I did. It's not that it's a bad book...it's just that I well and truly judged this book by its cover and its blurb - and it wasn't what I was expecting. Which seems to ring true with a few other reviews that I've seen. I was expecting it to be the story of a middleaged doctor who receives a Reading 'French Rhapsody' isn't the worst mistake I've ever made. I was expecting it to be the story of a middleaged doctor who receives a long-delayed letter from a record company - offering his old band a record deal, before telling us how he went and reunited with the rest of the band members. To some extent that is the plot - but it's not a story about music, and it's not really a story about the reunion. In fact it's a cutting commentary on politics, bureaucracy and how relationships change over time. I've never read anything by the author (Antoine Laurain) before so, in fairness, perhaps if I'd have been more aware of him I'd have known what to expect. The whole forgotten letter from the record company takes up only a small amount of French Rhapsody's 215 pages. The rest of the story mainly covers an upcoming French Presidential election and how two of the ex band members are running for office. One is a notorious leader of a far-right group, the other is a suave and mysterious economist who seems to have an answer for everything. Both characters are very engaging and there are a couple of twists with both of them that you'll never see coming. It's a philosophical read and, when not talking politics, it brings up a lot of thoughts on how we change as we get older and how different priorities appear and take over those priorities that only seem important to you when you're young. I also liked how some of the chapters were written from other characters' points of view, as if they were extracts from their diaries. All in all, I couldn't get away from the feeling that French Rhapsody was so different from what I expected that I didn't feel satisfied with it - luckily it's a fairly slender book, so it didn't take up too much of my time. The only other comment I'll make is that, while I'm a fan of an arty narrative, it was a bit hard to follow - I wonder if perhaps a few of the sentences were a little lost in translation. I'm not sure exactly why, but I loved this book. It's an effortless read and very entertaining. Alain Massoulier is a middle-aged doctor who leads a comfortable, if perhaps predictable, life in Paris. Out of the blue he receives a potentially life-changing letter that had been posted 33 years earlier and had languished in the French postal system all these years. In 1983 he had been a member of a band The Holograms and the letter was from Polydor offering them a recording contract – 33 years too I'm not sure exactly why, but I loved this book. It's an effortless read and very entertaining. Out of the blue he receives a potentially life-changing letter that had been posted 33 years earlier and had languished in the French postal system all these years. In 1983 he had been a member of a band The Holograms and the letter was from Polydor offering them a recording contract – 33 years too late as having failed to make a name for themselves as a band, they all went their separate ways. Alain is thrown by this letter and becomes quite nostalgic, searching the house for a box of band photos and a cassette recording, desperately wanting to listen to a particular track that had been playing in his head since the letter's arrival. As he reminisces we learn how the five band members from very diverse backgrounds got together to form the band. The more he thinks of the past and the letter, the more he experiences feelings of fury and injustice. He has thoughts of what might have been. I liked the lines in the book, “You think you have buried your youthful dreams, that they've dissolved in the fog of passing years and then you realise it's not true! The corpse is still there, terrifying and unburied.” He decides to search for his former bandmates and try to make contact to tell them what has transpired. He is also hoping that one of them will have a copy of “Such Stuff as Dreams Are Made On”, the track that had impressed the record company. I was never in a band, I'm not a doctor, I'm not even in my 50s (I'm older than that) but somehow I could connect with the story – maybe it's wondering what might have been if another path had been taken? The book is funny, nostalgic, charming and at there's a bit of satire in there too. It's well written and has some great characters. The characters are all very diverse. Some have made a name for themselves in the 33 years that have passed. They are all interesting and well drawn. I love how the present and the past are interwoven almost seamlessly. Oh yes, and there are a couple of nice twists in the story. I really enjoyed this book! It was actually refreshing reading a French novel that didn't seem like Amelie-- making France a storybook dream -- but rather truer to life, with its own social political economic problems and real people who inhabit it. I love France but I laughed out loud at the bit where Frederic tells Alain "why does anyone live here? Everyone is so unhappy!" The best way to describe Antoine Laurain’s latest novel – French Rhapsody – is that it is a brilliant “pay off” story. It is clever and quirky and was a delight to read. The story opens with Alain Massoulier receiving a letter that would have changed the course of his life had he received it on time. Unfortunately, he received it 33 years too late. This opens up a period of searching in Alain’s life to reconnect with the people of his youth. This comes with strange and wonderful consequences. What The best way to describe Antoine Laurain’s latest novel – French Rhapsody – is that it is a brilliant “pay off” story. It is clever and quirky and was a delight to read. What I love about foreign literature is that the stories are undeniably original. French Rhapsody is the most original story I have read this year. There are twists and turns and it is laced with “oh my gosh!” moments. I couldn’t recommend this book more. Read it. Be amazed and pass it on to someone else to share in your bookish joy. French Rhapsody by Antoine Laurain is available from 11th October 2016. For more information regarding Antoine Laurain please visit www.antoinelaurain.com. Another well written, easy to read book from Antoine Laurain. Having said that though, the story was not what I expected, and although I enjoyed it, I'm slightly disappointed that I did not get what I had expected. This was a well written, slightly unbelievable tale of how a member of an unsuccessful pop group became President of France - though at present lots of things that we never thought possible are becoming reality, and perhaps this will too one day. I was given a copy of this book by the Another well written, easy to read book from Antoine Laurain. Having said that though, the story was not what I expected, and although I enjoyed it, I'm slightly disappointed that I did not get what I had expected. This was a well written, slightly unbelievable tale of how a member of an unsuccessful pop group became President of France - though at present lots of things that we never thought possible are becoming reality, and perhaps this will too one day. I loved this from start to le fin. Superb! The hunt for a long lost demo tape leads Alain to meet up with an eclectic mix of characters. There is humour and humanity, wistfulness and whimsy throughout. Faultless. I'm especially pleased as it so very recent, events from as late as April this year are referenced within the pages and yet my library had a copy! Vive les bibliotheques! VERDICT: Quirky and nostalgic, hilarious and satirical. A portrait of France as you may not know it! Die einzelnen Charaktere werden nun nacheinander und teilweise etwas überspitzt vorgestellt. Keiner der ehemaligen Bandmitglieder ist der Musik treu geblieben. Jeder hat sich in eine andere Richtung entwickelt, wobei einige doch sehr erfolgreich geworden sind. Da ist zum Beispiel der rechtsradikale Sébastian Vaugan - damals ein begnadeter Bassist und heute Kandidat zur Präsidentschaftswahl. Auch der ehemalige Schlagzeuger Stanislas Lepelle hat Karriere gemacht. Er ist Künstler, exzentrisch und verbittert und genauso unsympathisch, wie sein rechtsradikaler ehemaliger Bandkollege. Wo Bérangère, die damalige Sängerin, in die alle verliebt waren, abgeblieben ist, weiß niemand. Der ehemalige Pianist Frédéric Lejeune lebt in Thailand. Die Brüder Pierre und Jean-Bernard (kurz JBM genannt) Mazart, die für Text und Produktion zuständig waren, sind ein verschrobener Kunsthändler und ein Computergenie. Letzter ist ungewollt zum Präsidentschaftskandidat aufgestiegen und ist gemeinsam mit seiner intelligenten Assistentin das einzige sympathische Gespann. Alle Charaktere sind nicht wirklich Sympathieträger mit Ausnahme von JBM. Der Autor hat die Bandmitglieder teilweise mit sehr exzentrischen Eigenschaften erschaffen. Während JBM sehr viele Seiten gewidmet sind, werden andere Bandmitglieder nur kurz erwähnt. Das fand ich schade! Leider geht es hier auch kaum um Musik, was ich vermisst habe. Zu Beginn hatte ich ein paar Probleme die Namen den richtigen Personen zuzuordnen. Wie schon bei "Der Hut des Präsidenten" wechseln die Charaktere und erst am Ende ergibt sich ein Ganzes, auch wenn es sich in Antoine Laurains neuem Roman nicht ganz so anfühlt. Mit jeder Figur, die er vorstellt, vermittelt er ein bestimmtes Thema und ist dabei ziemlich politisch unterwegs. Er wirft dabei immer wieder einen kritischen Blick auf die heutige Gesellschaft. Leider gibt es im Mittelteil einige Längen, auch wenn der Roman nur 256 Seiten. Im letzten Viertel kommt der Roman ziemlich in Fahrt und das Ende konnte mich wirklich überraschen. Für mich leider zu spät! Zum Thema Brief hat der Autor noch eine sehr interessante Wendung eingebaut, die ich absolut gelungen fand. Antoines Laurains Schreibstil ist charmant und manchmal etwas überspitzt. Französische Autoren schreiben meiner Meinung einfach anders und Laurain ist ein typischer Vertreter des Landes. Seine Figuren haben Ecken und Kanten und wirken trotz seiner Überzeichung lebendig und authentisch. Über jedes Kapitel hat der Autor einen passenden Satz zum nachfolgenden Inhalt gesetzt. Alain, Stanislas, Sebastien, Frederic, Pierre, JBM und Berangere hatten große Träume im Paris der 80er Jahre! Sie wollten mit ihrer Band [i]Hologrammes[/i] berühmt werden und die Konzertsäle auf der ganzen Welt erobern. Doch es kam anders. Nachdem auf ihre Bewerbung bei einer großen Plattenfirma nie eine Antwort kam, zerfielen ihre Träume langsam zu Staub und sie gingen auseinander. Den meisten von ihnen begegnen wir mehr als dreißig Jahre später wieder, als sich nämlich etwas Unerhörtes ereignet: Alain, Stanislas, Sebastien, Frederic, Pierre, JBM und Berangere hatten große Träume im Paris der 80er Jahre! Sie wollten mit ihrer Band [i]Hologrammes[/i] berühmt werden und die Konzertsäle auf der ganzen Welt erobern. Doch es kam anders. Den meisten von ihnen begegnen wir mehr als dreißig Jahre später wieder, als sich nämlich etwas Unerhörtes ereignet: Alain, inzwischen ein einigermaßen desillusionierter Arzt, im täglichen Einerlei steckengeblieben, erhält nämlich, sehr verspätet, die Antwort jener Plattenfirma, die die Band zu Probeaufnahmen eingeladen hatte! Wie konnte das geschehen? Nun, der Brief war ganz banal auf der Poststation verlorengegangen - um nach langen Jahren bei Umbaumaßnahmen doch noch aufzutauchen. Von Stund an ist für Alain nichts mehr so, wie es war. Er erinnert sich alter Zeiten, alter Träume - und beschließt, die Freunde von einst aufzusuchen, um sein Wissen um die vertanen Möglichkeiten mit ihnen zu teilen. "Laurains Humor und sein Sinn für Melancholie sind unvergleichlich. Wäre der Roman nicht so komisch, würde man schluchzen ob all der verpassten Möglichkeiten". So äußert sich "Le Figaro" zu dem Roman des Franzosen Alain Laurain. Nachdem ich die Geschichte zum ersten Mal gelesen hatte, stellte ich fest, dass ich "Le Figaros" Einschätzung zunächst nicht teilen konnte, zumal ich sie ganz und gar nicht komisch und auch nicht melancholisch fand. Ich mutmaße, dass der Grund dafür in der Art und Weise zu suchen ist, auf die französische Autoren Romane schreiben, und dass mir ihr Charme nicht leicht zugängig ist. Auch mit den Protagonisten konnte ich nur wenig anfangen, sowohl ihre Verhaltensweisen als auch ihre Lebensart erschienen mir fremd, sperrig, unverständlich und überhaupt nicht nachvollziehbar. Doch begann, weit nach der Hälfte des Buches, der Schleier sich zu lichten und ich bekam ein Gefühl für die Geschichte. So entschloss ich mich, sie ein zweites Mal zu lesen - und siehe da, ich war plötzlich eingefangen in dem Gespinst von zerborstenen Träumen, das Alain Laurain hier gewebt hat, mit federleichter Hand, mit feinem Humor, der, wie ich mutmaße, typisch französisch ist und, ja, mit eben jener, von "Le Figaro" zitierten Melancholie. Die vorher verschwommenen Akteure nahmen Kontur an, ließen mich ihre Sehnsüchte, ihre Trauer, ihren Lebensüberdruss und Zynismus, aber auch ihren Pragmatismus spüren, mit denen sie nach dem Ende ihres Traums von Ruhm und Ehre entweder scheiterten oder aber ein ganz anderes Leben aufgebaut haben, in dem die meisten von ihnen am Ende des Romans auch zuhause sind. Eine irreale Geschichte? Ganz bestimmt! Ein Roman mit märchenhaften Zügen über Scheitern, Verzagen, Aufgeben und Weitermachen - über dem eine ganz bestimmte Melodie schwebt, die nämlich des einen Liedes, das Alain sein Leben lang verfolgt hat und das der Band zum Welterfolg hätte verhelfen können! Antoine Laurain was born in Paris and is a journalist, antiques collector and the author of five novels. The President’s Hat, a charming fable set in the Mitterrand years, was awarded the Prix Landerneau Découvertes and the Prix Relay in 2012 and is published in English by Gallic. It was a Waterstones Book Club book and ABA Indies Introduce pick in 2013. Antoine was chosen to represent France at E Antoine Laurain was born in Paris and is a journalist, antiques collector and the author of five novels. The President’s Hat, a charming fable set in the Mitterrand years, was awarded the Prix Landerneau Découvertes and the Prix Relay in 2012 and is published in English by Gallic. It was a Waterstones Book Club book and ABA Indies Introduce pick in 2013. Antoine was chosen to represent France at European Literature Night 2014. He is also the author of French Rhapsody, The Portrait, Smoking Kills and Vintage, 1954 is coming out in June 2019!